In Donauwörth, the "bayrisch schwäbische Donauperle" nearby the romantic street, embedded into the hill oft the "schwäbische Alb" and the "Frankenjura" at the junction of Donau and Wörnitz. 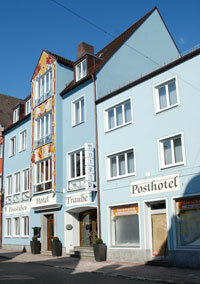 Posthotel Traube is city central of the dignified "Freie Reichsstadt Donauwörth". Comfort and familial effort are the coverage of the personal atmosphere at this traditional house. Our hotel includes the Cafe Mozart, the restaurant, the "Poststube" as also the beer garden. Hotel-parking slots are nearby the house. conferences, seminars, company parties, journeys, travel business.Please contact us, we are looking forward to get to know you.